Situated in Lauderdale, off the main road from Edinburgh to the valley of the river Tweed, Thirlstane Castle was originally built in the 16th century by Sir John Maitland, chancellor to King James VI in wthe county known then as Selkirkshire. By this date, castles no longer needed to be fortified to the same extent as before and this trend was even more evident when it was remodelled by John Maitland, Duke of Lauderdale, in 1670 when its height was increased to six storeys. It was extended again in 1840 and the interior has been much altered too. Sir Richard de Matulant (Maitland) was a descendant of a Norman family who came over with William the Conqueror in 1066. The Maitlands had estates in Northumberland and in the Scottish Borders and the ruins of an original Thirlstane castle stand some two miles from the present building. William of Thirlstane was a supporter of Robert the Bruce and in the succeeding centuries the old castle was occupied more than once by English invaders. Sir William Scott of Thirlestane (1645-725)was a lawyer and poet. He was the eldest son of Sir Francis Scott, of Thirlestane, Selkirkshire, and Lady Henrietta, daughter of William Kerr, 3rd Earl of Lothian, who married in 1673. He was admitted a member of the Faculty of Advocates on 25 February 1702. He died in 1725 and he is buried in the sealed south-west section of Greyfriars Kirkyard in Edinburgh commonly called the "Covenanter's Prison". His family share the vault with the Kerrs of Chatto, often referred to as Scott Kerr of Chatto. In 1699, Sir William married Elizabeth, only surviving child of Margaret Brisbane, 5th Lady Napier, and her husband, John Brisbane, son of an Edinburgh writer. After her death he married Jean, daughter of Sir John Nisbet of Dirleton, East Lothian, and widow of Sir William Scott of Harden. Francis Scott, son of the first marriage, became the sixth Lord Napier on the death of his grandmother, who was predeceased by his mother. 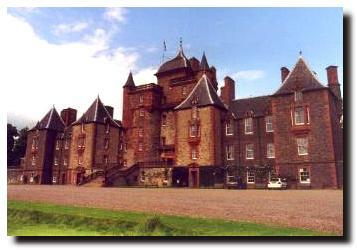 Visitors to Thirlstane can tour round all the ground floor apartments, including a grand bed-chamber with its four-poster bed and ornate plaster ceiling, and a large drawing room. Beside the fireplace is a bust of Captain Sir Frederick Maitland who accepted the surrender of Napoleon after the battle of Waterloo. Thirlstane abounds in portraits of the various Earls of Lauderdale, the walls in the dining room in particular is covered in these. The dining room chairs were originally made specially for the Duchess of Richmond in Brussels and were used at a grand ball on the eve of the battle of Waterloo. By contrast to some of the grander rooms, Bonnie Prince Charlie's room is relatively modest. The Young Pretender stayed at Thirlstane as he marched south through Lauderdale after the victory over Sir John Cope at Prestonpans. There is an obligatory portrait of the Prince on the wall but the room is now furnished in 19th century style. 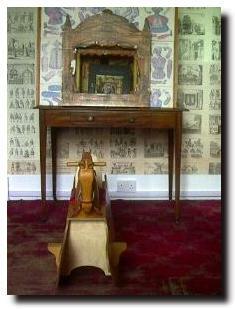 The role of Thirlstane as a home as well as a castle is emphasised by the nursery with a display of children's toys and games. 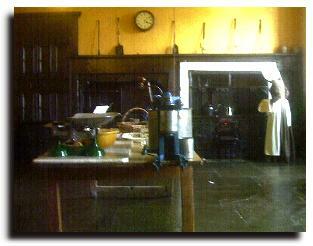 The tour also includes the kitchen (with huge cast iron ranges), scullery and laundries of the castle. 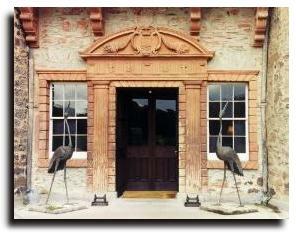 There is also a "country life" exhibition which show the lives of the ghillies, gamekeepers and estate workers.